Wide brimmed hat with curving wedges shaped by short rows and clever increases and decreases, making the hat a funky knit! 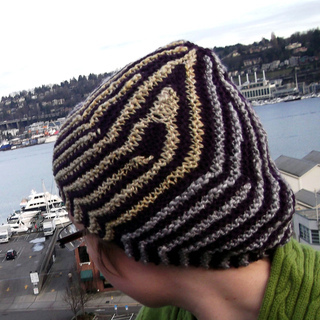 Hat is knit flat with short rows and grafted at the end. Loki is a Norse god and shape shifter who both helped and caused trouble for the other Norse gods and goddesses. He could turn in to a seal, mare, salmon, and fly.